Your contact center is an essential resource for driving revenue and customer satisfaction. With the right solution from BroadConnect, you can enhance agent productivity, improve contact center metrics, increase efficiency and control costs. If you are restrained by the limitations of a multi-vendor or legacy infrastructure, it’s time to consider a new strategy. 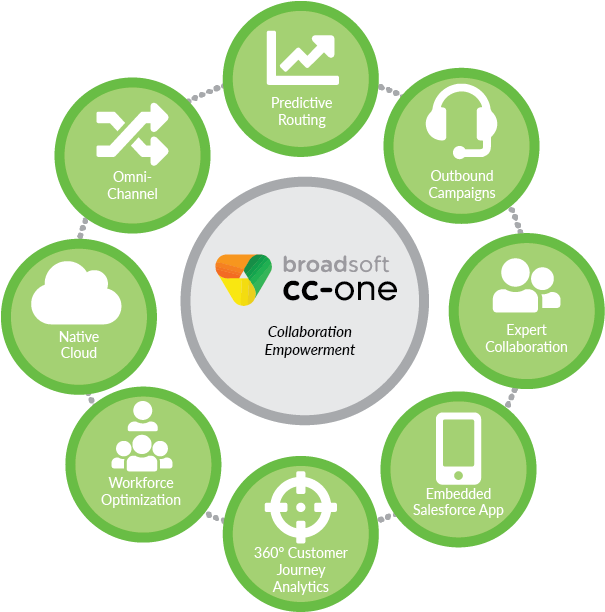 BroadConnect CC-One is a cloud-based solution with the scale and flexibility to meet any business need from a first contact center to a multi-site, multi-channel enterprise deployment. With CC-One you can offer customers the freedom to contact through their preferred channel, with seamless interaction across email, voice, chat, text, instant message, social channels, video or web collaboration. And, we can provide a smooth migration path from your existing system to a tailored CC-One solution in the cloud with minimal disruption. BroadConnect CC-One can transform customer experience while improving contact center efficiency, productivity and control. Sophisticated web portal to manage and monitor agent performance, ACD and IVR systems, and integration with business applications. Comprehensive facilities for email, voice, chat, text, instant message, social channels, video or web collaboration in one seamless, integrated solution. Agents can easily communicate with supervisors and managers, colleagues and subject experts for advice and support. Comprehensive information on agent performance and customer actions to improve business outcomes. Calls are routed to the right agent by customer choice or business rules. Agents and managers can monitor and analyze the customer journey for greater insight. Faster resolution, personalized service and enhanced customer experience improve satisfaction and loyalty. Comprehensive management information to balance or scale resources across multiple sites. Agents can access customer information and knowledge-bases to speed first-time resolution. CRM integration and predictive routing help top agents drive more revenue. Sophisticated routing, queue management and caller information reduce the risk of abandoned calls. Seamless access to all channels, simpler internal collaboration and CRM integration improve agent productivity. CC-One is part of BroadConnect Canada’s comprehensive portfolio of communications solutions for small, medium and large businesses. Together, these solutions help businesses improve collaboration, mobility, agility and customer service. To find out more about CC-One and other BroadConnnect solutions, contact us.